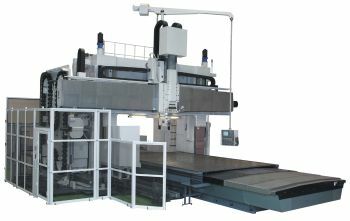 CNC machine tool manufacturer Okuma America Corporation will host Double Column Demo Day on Tuesday, August 7, 2012 beginning at 10:30am. The event will focus on educating attendees on the features and benefits of the MCR-BIII, Okuma's largest double column machining center available. The machine will actually be cutting metal, providing visitors the opportunity to see, first-hand, this equipment in action. "Because these machines are so large and typically require special installation foundations, we don't usually have one installed for people to see in person", states Brian Trei, Okuma's double-column machining center product specialist. "The chance to actually see a machine of this size, in an easy-to-access, non-production environment is rare and we hope a lot of people take advantage of this opportunity." In addition to the presentation on the MCR-BIII, attendees will also partake in a tour of both the Okuma and Partners in THINC facilities, lunch, and an overview of the double column lineup of machines, followed by social hour and dinner. The MCR-BIII, Okuma's largest and most sophisticated double column machining center, was engineered with Okuma's field-proven experience of building exceptional power, rigidity, and smooth operation to ensure close tolerances over time and high production. Built on Okuma's exclusive Thermo-Friendly Concept, the MCR-BIII ensures precision and repeatability for even the most demanding tolerances. The MCR-BIII is equipped with Okuma's open-architecture THINC®-OSP Control.